Is a smartphone worth using as a digital still camera? Like the iPhone 5, most of today’s competitive smartphones sport a camera with a sensor of at least 8megapixels. This is a far cry from one of the world’s first mass-produced camera cellphones, the Sharp-made J-SH04, which had a sensor resolution of 110,000 pixels, or just 0.1-Mpix. Nokia has blown all of these specifications out of the water with its new, bulky, 41-megapixel Nokia 808 PureView. But shrinking and squeezing more megapixels onto a sensor’s surface does not necessarily translate to better image quality. Smaller pixels and their reduced area-size absorb less light, which consequently leads to a reduction in their signal-to-noise ratio, often leading to noisier images, as can be seen in the following graph comparing a smartphone and a DSC (both with 12-Mpix sensors). The effect of small pixels on noise can be seen in the graph for two cameras, both of which have a 12-Mpix sensor. 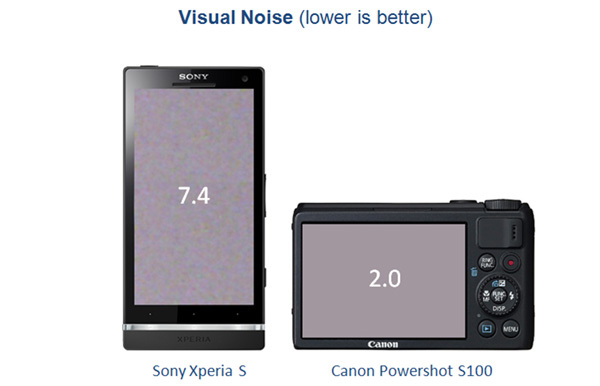 Visual noise (measured using DxOMark Mobile protocols under a tungsten illuminant at 20 lux) is around 4 times higher for the Sony Xperia S smartphone compared to the Canon Powershot S100 DSC. Many mobile devices address noise through their imaging filters and processors. But tamping down noise frequently leads to other image defects, such as loss of detail and texture, as pictured below for the Galaxy S III. The Galaxy S III’s denoising filter aggressively prevents noise, but has the effect of softening images, as seen in the photoson the left. The iPhone 4S, right, struggles with tamping down noise, but better maintains texture and details. Both images were taken at 20 lux and under tungsten luminance. 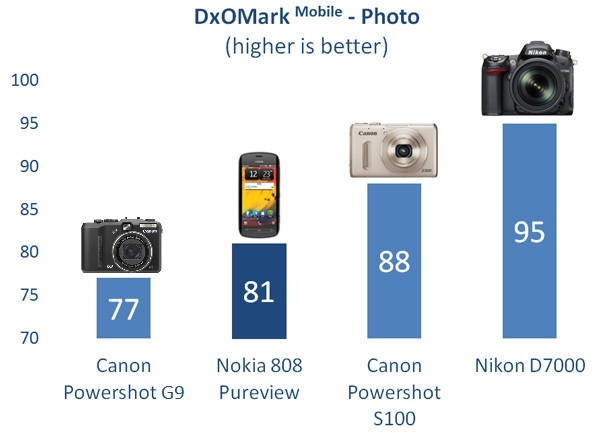 The Nokia 808 PureView, the best-ranked mobile for taking photos in the DxOMark Mobile database, achieves a still image performance in between that of a 5-year-old DSC and a 1-year-old DSC’s, as summarized by DxOMark Mobile – Photo scores. 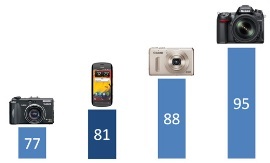 The full HD videos of the Samsung Galaxy SIII, the best smartphone DxOMark Mobile has tested so far, are truly impressive, with better quality than those of the Canon Powershot S100, as shown in the graph below. 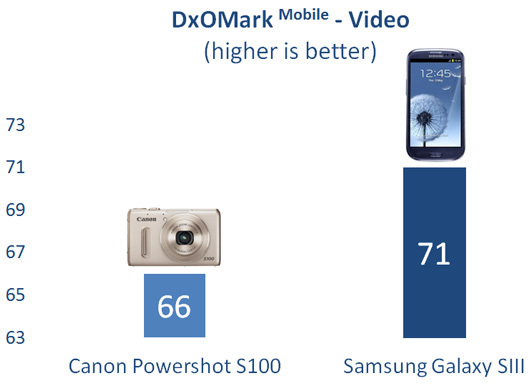 The Samsung Galaxy SIII takes the lead on video performance over the 1-year-old Canon Powershot S100 DSC, as summarized by DxOMark Mobile – Video scores. We will be publishing more detailed analyzis and comparisons in the next few weeks, and as DxOMark Mobile moves ahead, we are open to suggestions and feedback!